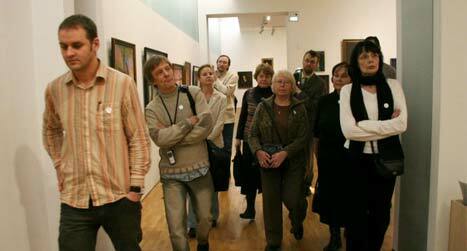 The BAAC Estonian working group had its last meeting of the year 2006 on December 13 at the Kumu Art Museum, Tallinn. This new centre of Estonian art was opened in February 2006. The huge building of the Museum is located next to the President’s Palace in Kadriorg Park (http://www.ekm.ee/kumu.php) and has become very popular with Estonians as well as with guests of Estonia. Our host was Marju Kurvits, a lady who should already be familiar to Riga Seminar participants and who is now working at the Kumu`s photo archive. The other participants of the meeting were: Reet Harkmaa, Eha Väinsalu and Tiit Kimmel (Estonian Television), Lea Tegelmann (Film Archives), Sulev Sepp (Scanpix Baltics), Andres Didrik (Tartu University Library), Ott Valk (Estonian Theatre and Music Museum), Tõnis Liibek (Estonian History Museum), Marko Leppik (Wiseman Interactive OÜ), Piret Noorhani (Estonian Literary Museum). To start the meeting, the latest news and some information was shared about recent activities. Reet Harkmaa and Piret Noorhani discussed an interesting seminar on audiovisual heritage ”Auvis – elementaarne või elitaarne” (”Audiovisual Artefacts: Elementary or Elitist?”) on November 11, organized by the Tallinn City Library. The seminar was meant mostly for the librarians working with AV collections, but the range of the institutions from where the presenters came was much broader: libraries, museums, Estonian Radio, Estonian Academy of Music etc. BAAC as a new organization, and also the IASA-BAAC Conference 2007, were presented by Piret Noorhani. Piret Noorhani also gave a short overview of the conference on national reasearch collections, held at the Tartu University Library on November 15. This conference was organized by the group of experts of the national collections. The group works at the Ministry of Education and Research and consists of the representatives of the research institutions maintaining the collections of national significance. The conference aroused a great deal of interest because of the first summaries of a survey of those collections. The IASA-BAAC Conference 2007 was the next topic of the day. As the first call for conference papers was December 15, it was an opportunity to find out which institutions would be sending in proposals. After lively discussions and some persuasion, most of the institutions represented at the meeting in Kumu promised to participate in Riga with their presentations. Some ideas about who could be the newcomers came up as well. Contact persons were entitled to start the negotiations as soon as possible. The Estonian experience shows that formal letters and invitations will do only a half of the job, the rest (or actually the most!) should be done through personal contacts. Talk to people and they will respond! After that the working group was informed of the BAAC board meeting and the seminar at Lithuanian Television in Vilnius on February 13-14, 2007. Juozas Markauskas has done a great job, at many levels, in bringing together a group of Lithuanian AV archivists. It is hoped that they will continue working after the meeting in Vilnius is over. They could become a reliable partner for the Baltic and Nordic AV archivists. The financing of national and/or international archival cooperation was discussed. The programme of the Nordic Council of Ministries ”Nordplus Neighbour”, which is supporting professional networks in the Nordic and Baltic countries, could help us to finance the seminars and workshops which may become a possible format of future cooperation. Baltic arhivists need better education and fresh ideas. And as we have seen, our Nordic colleagues are eager to help us with that. Estonian Television is ready to host the next travelling seminar after Vilnius ─ in Tallinn, at ETV in May or June, 2007. It is still to be determined if the ”Nordplus Neighbour” will announce a new project support programme, available to us in 2007. The contact person of the NCM in Estonia promised to give us information about it at the beginning of 2007. Some other plans were made for 2007. The next meeting will take place at the beginning of March at the Estonian History Museum in Tallinn. The working group would also like to meet in 2007 with the representatives of the Ministry of Culture to find out if and how they could support activities of BAAC and its Estonian branch. The current situation of the development of the unified information system for the museums, MUIS, is continuously a hot topic for many of us. Meeting with the representatives of the compilers of the information system, as well with the council for digitization at the Ministry of Culture, has already been discussed at our previous meetings. Let`s hope, all those meetings and discussions will take place in 2007. One thing is clear: even in an information society we still need more information. The need for efficient networking is one of the key words of the time. Strangely enough, though it seems sometimes, that we have too many contacts already, we actually need even more of them. We do need well working contacts between colleagues and institutions. We need to know more about different initiatives. That seems to be a reason, why Estonian AV archivists are gathering so readily. Every time we can hear and see something new. Last time at the Kumu Art Museum, we were given a very educational tour by Alar Nurkse, who walked us through the exposition to the new and well equipped restoration department. Personally, for me it has been the third visit to the Kumu and the third time to hear an expert talking about the history of Estonian art. Still, it was a new story, told from a very different point of view. This time we looked at art through the eyes of a restorer - a top specialist, a convincing fanatic. To him are talking not only the names and images but also frames and canvases, walls and nails. But after seeing how is working one of the most experienced restorers Sirje Alter at her workshop, we were all amazed - by her devotion and great professionalism, which is – as it often happens – paid for very modestly. I am sure, that meeting with those hard-working people gave a us all some fresh energy to continue with our own responsibilities. Although our kind host Marju convinced us to stay for a presentation of the monography of the well-known Estonian artist Olev Subbi, just beginning at the Lobby Hall right after our tour, we didn`t want to mix emotions. We left Kumu and all those prominent people and the waiters and the wine… with a great contentment. We had a firm conviction, that at our next meeting, we could experience something as amazing as at the Kumu. It just happens every time when you see great people doing excellent work.